You can never be too prepared for an imminent zombie attack. So it's probably a good thing that there's a range of experience days where you can learn armed combat skills to defend yourself should these creepy creatures attack civilisation as we know it. Brace yourself for a psychological thrill like no other. This certainly isn't for the faint-hearted. If you tend to watch Harry Potter from behind the sofa, this is not for you. However, if you like the odd horror film and you're up for a bit of a scare, this will be right up your alley. Here's the cream of the crop. Your first thought might not be bloodthirsty zombies when you picture Reading in Berkshire. It's home to an abandoned shopping centre where a virus outbreak is taking grip. You and your adversaries will be briefed and armed with realistic weaponry, before being let loose. The deserted retail site sets a spooky tone, and the movie quality props and special effects just add to the surreal experience. Head up and down the escalators moving around the abandoned shops in this 250,000 square foot abandoned shopping precinct. 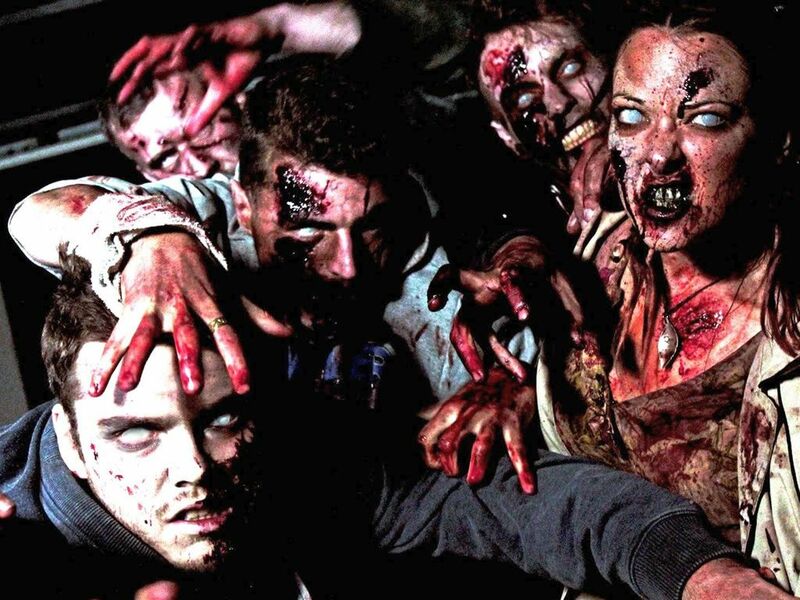 This immersive two-hour zombie experience is constantly raved about in the press, and is most definitely the king of zombie themed activities. It receives many 5-star reviews from customers. It even scooped ScareCon’s 2016 "UK Best Zombie Experience" award. Get a taste of both sides of the action in this split-personality experience. Spend half your time duelling scary zombies and the remainder of your time as a zombie. This combines the Zombie Boot Camp experience (see below) with the Zombie School experience. In the boot camp you'll be armed with riot gear and after some training, you'll be sent in with your team to defeat the onslaught of flesh-eating monsters. Then, in the school, after a spot of work from a make-up team, you'll be taught how to rock the ways of the living dead. Watch out as a squad of zombie hunters is on its way to take you on. Join up to 36 fellow eager saviours keen to save civilisation from an outbreak of zombies. Here you'll deal with a zombie infection situation which you and your team will eradicate to stop the spread of the walking dead. You'll have limited resources available so need to work as a team to make clear decisions to complete missions along the way. Your survival depends on that hapless lot. Several locations around the country host this event and each is picked based on its authenticity to the storyline. Zombies have no respect for the law, and in this experience you'll storm an abandoned courthouse in West Bromwich in the West Midlands in search of the undead. You'll be armed with a real imitation firearm where you and your team will destroy the infected and undead in your path. Your objective is to complete missions in order to secure the building, ensuring the rest of us civilians can sleep easy at night. Your country thanks you. The zombie themed weaponry training experience focuses mostly on weapons training albeit with a zombie twist. If you want terrifying graphic action, best look at another experience. However, if you want to learn the ins and outs of weapons training, this is ideal. Planning a trip to London? Have you set time aside to become a zombie for the day (what do you mean you haven't?). The London Bridge Experience and Tombs offers an experience where you become part of the show. Go behind-the-scenes of this gruesome attraction and become a frightening zombie as a professional artist works their magic on you. Then scare unsuspecting tourists in the live show. Zombie boot camp is much like riot training on steroids. Decked up in all the protective gear and equipment you can imagine, you'll be put through your paces as you clear an abandoned facility of these horrifying monsters. A boot-camp is also available after dark to make it just that little bit extra terrifying. Zombie battle bunker sees willing volunteers take on zombies beneath the streets of Greenwich, London. WHEN: Events take place on selected dates across the year. These are usually weekends, although it varies between experiences. Expect a group of fellow zombie hunters to join you which only adds to the excitement. WHERE: Zombie experiences usually take place in creepy abandoned venues or purpose-built training facilities. Historically, they have taken place in London, Reading (Berkshire), Droitwich (Worcestershire), Sheffield (Yorkshire), Rutland (Leicestershire), Heywood (Lancashire), Liverpool (Merseyside), Nottingham (Nottinghamshire), and Birmingham (West Midlands). WHO: This is aimed squarely at those obsessed with zombie culture or those who live in daily fear of an impending apocalypse. Either type of person would be over the moon receiving a thrilling and downright scary experience like this. It's certainly not one for the squeamish. OCCASIONS: This has 'birthday present' written all over it. It would also suit as a Christmas present for a zombie fan, although lacks a festive vibe. Even zombie experiences can't survive an apocalypse. Some have bitten the dust. These are some of the more memorable losses in recent years. Set in a 65-acre manor house estate in Warrington, near Manchester, you'll need to clear the land of zombies in a 3-hour search-and-rescue style experience. The manor is a haunting backdrop to this experience. Wilderness survival training meets zombie apocalypse preparation training in this experience in Ambleside, Cumbria. It's perhaps an odd combination of experiences but you'll certainly pick up some practical survival skills here as they are put to the test. While most zombie themed experiences base themselves on you saving the world from an infestation of flesh-eating creatures, this experience takes a completely different angle. Here you become a zombie yourself, complete with detailed make-up and props. Undertake vital training on how to act the part now you certainly look it. All that's left to do is find a job where you can dress as a zombie Monday to Friday! Hi, my mum has booked to take part this Saturday but unfortunately it is now impossible for her to come. She was wondering if there is any possibility to change the date. It would be greatly appreciated in circumstances that are out of her control. Thanks very much. Contact your experience day supplier asap to find out. They might be able to alter the date for you. The closest venues to Bristol are Droitwich (Worcestershire) and Reading (Berkshire). I was given two tickets as a gift at Christmas – how do I book a date as I can’t see where to put the various codes in? Thanks! Full instructions should be printed on the voucher on how to redeem your tickets. Hi, me and my brother are coming on Saturday and we plan to go out afterwards, will we get dirty I .e will a change of clothes be necessary? You’ll need a change of clothes as battling those zombies can be dirty and dusty work! Hello big question i am party disabled i can do anything but crawl and run but i walk very fast. Is there an expiriance i be able to do love the blitz but in video they crawl. any ideas please. I’d strongly suggest contacting the experience provider directly as they would be able to offer accurate advice based on your own circumstances. Experiences typically last between one and three hours, depending on which you opt for. Full details can be found on individual retailer websites. Hiya I would like to apply for a job but I don’t know how to email you about it. I might resemble a zombie first thing in the morning but as a blogger, I don’t specialise in zombie recruitment. However, the zombie school experience sounds right up your street. Hi there – are there any age restrictions? I’d like to bring my 13 year old nephew. Minimum ages vary depending on the experience. The most terrifying or aggressive experiences will have a minimum limit of 16 or 18. Some experiences have a minimum age of 12, although stipulate that anyone under 16 must be accompanied by a paying adult. How do you get a job as a zombie? Good question. You’d need to be good at that undead thing and look worse for ware all day long. If you’d like to learn what it takes to be a zombie then head to zombie school.